- Statistical check functions selectable as CUSTOMIZED or ACCORDING TO LEGAL NORMS (as provided for by the directive N. 76/211/EEC) with acceptance/refusal criteria of the lot under examination. - DESTRUCTIVE or NON DESTRUCTIVE legal control (selectable). - Calculation and printing of the lot outcome and of the standard deviation. - Quantity check in ml by entering a density coefficient for each article. - Management of production lines: one can manage up to 10 products simultaneously on one or more scales (up to 1 scale for each line). 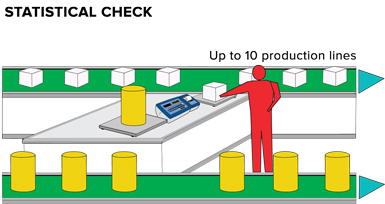 Up to 5 independent connectable approved scales, that allow to check with the same weighing system all the weight groups. Selfweighed, presettable tare (direct or calculated), manual or automatic tare; unlocked automatic tare function at the end of weigh operation. - Manual or automatic totalization, upon weight stability or only if within tolerante. Selection of visualized data on the graphic LCD display (totals, progressives, weight…). 15 configurable and printable text ID`s containing 16 characters, for example: Code, lot ID, operator ID, shift number, etc. Database of 1000 articles with 3 alphanumeric description of 20 characters, density coefficient, nominal weight, three +/- tolerance levels (T1, T2, T3), linked tare. 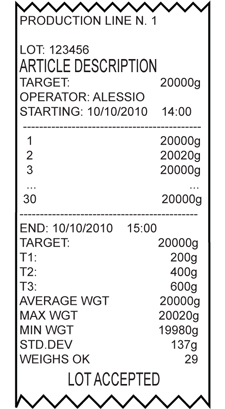 Programmable printout from keyboard or from PC (through the free Dinitools.net software) of 30 print formats (Print key, Totalization, Lot Report, Article Total, Partial total, General total, Grand total, First weigh heading); each print format may contain up to 2048 positions which may be ASCII codes or preconfigured print blocks (i.e. Company name, lot and weigh progressive numbers, gross weight, tare, net, article description, average weight, standard deviation, nr. of off tolerance samples, test outcome, date and time of beginning/end check, etc. ).